Disney Channel renewed its hit animated children’s series “Doc McStuffins for a fifth season, keeping Black girls’ representation alive. 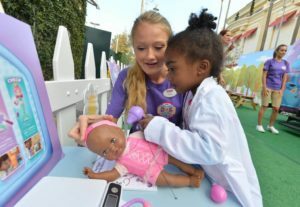 The show follows a young Black girl playing doctor to her magical toys in hopes of fulfilling her dream job as an adult. Disney Junior’s executive vice president and general manager Nancy Kanter revealed the news Nov. 16, according to Shadow and Act. That impact was magnified in July when an outpouring of concern over the show’s possible cancellation swept the Internet. On Twitter, comedian W. Kamau Bell spurred the hashtag #RenewDocMcStuffins to keep the show on the air. Later that month, a Disney spokesperson told The Huffington Post “a long-term content plan” was in place for the series and the show’s fourth season debuted on Disney Junior July 29. However, the show does not yet have an firm fifth-season premiere date. Kanter acknowledged the vociferous support for “Doc McStuffins” in her statement. Since the Peabody Award-winning show debuted four years ago, it has become a pillar for affirmative depictions of Black girls. “We hoped it would be [the] positive role model that wasn’t really out there,” “McStuffins'” creator Chris Nee told HuffPo in 2012. Today, representation shines more than ever before and not a moment too soon. Actor Djimon Hounsou revealed his dark-skinned son said he wished he had grown up with lighter skin after seeing only white superheros in media depictions. But the emergence of Black heroes like Luke Cage and Black Panther serve as an answer for that troubling statement. In that same vein, Snoop Dogg’s daughter, Cori Broadus boldly proclaimed on Instagram this week that she now loves her dark skin tone.